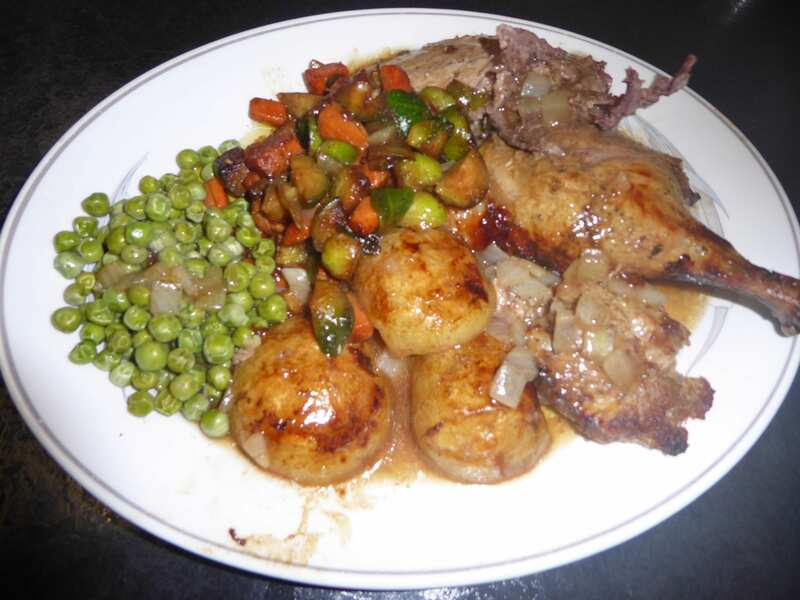 Home » Blog » Comments » cookery » Featured Articles » UK » Lyn’s Budget Recipes of the Week. The original recipe is a Curry, but the ingredients are far too interesting to drown the flavours with Curry! I used two whiting that I had in the freezer. I go to Hastings a couple of times a year and buy fish as fresh as it can be from the fishermen on the beach. It’s worth checking your nearest seaside town for fish stalls. Cook the fish in the oven for approx. 15 minutes, until the flesh comes away from the bone easily. When cool enough to handle, remove the flesh from the bone, then put all the skin & bones in a saucepan, cover with water & boil for half an hour or more. Fry the onion until transparent, then add the pepper & garlic. Stir in the other ingredients, drain the fish stock over the ingredients. Simmer, stirring occasionally. The sauce should thicken. If it gets too dry, add some more water. The humble omelette can get overlooked as a main meal. I use 5 eggs for two people. Forget what the Experts do. Don’t keep moving the mixture around all the time. Let it set for a few seconds, make sure the edges are free from the pan, & leave to set. 5 eggs, beaten in a bowl. Simply, tip half the egg in a small frying-pan, let set for a while, then add the ingredients of your choice to half the omelette. Season. Cook for a bit longer until the omelette is set underneath, then fold it over the ingredients & cook for a couple of minutes more until the ingredients are heated. Serve with chips and/or a salad, if the omelette isn’t enough for you on its own! 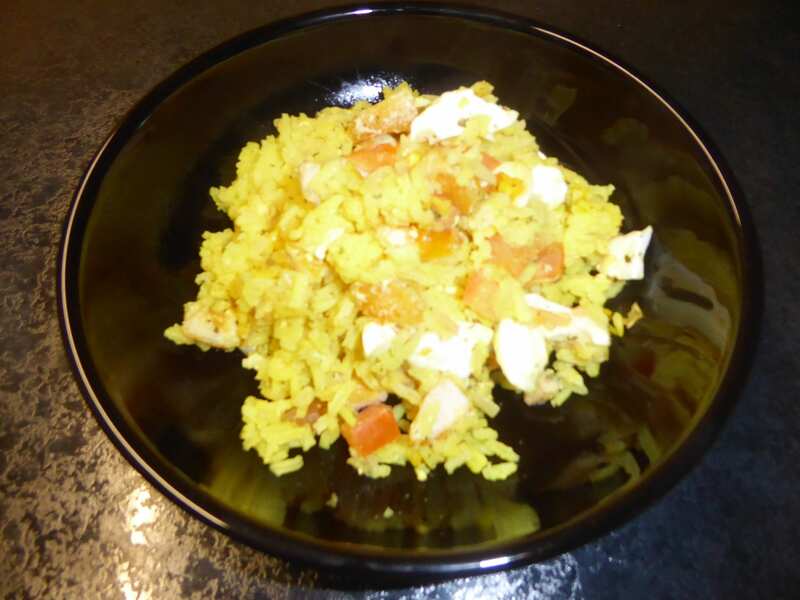 Kedgeree was a British Empire dish from India. I’ve always found it a bit dry & bland, so I’ve adapted & hopefully improved it. Cook your rice with a dash of Turmeric to give it spice & colour, then drain it. Soft Boil 3 eggs, then roughly chop them & add to the rice. Gently fry an onion in oil until transparent. Chop the fish into small cubes & gently cook in a small drop of milk, turning them for a few minutes. Tip the fish & milk in with the rice. Add the onion, a chopped tomato, a shake of parsley, a generous shake of Cayenne & seasoning. Stir to mix & heat through in the oven. Even avid sprouts haters love this dish! I add chopped onion & carrots to the original recipe. Chop the Brussels Sprouts, but not too fine. Half & half again should do. Place a dash of oil in a pan, then tip in the sprouts, onion & carrots. Cook on a fairly high heat, adding some coriander, cumin & lemon or lime juice & stirring it in. Season & serve with a roast dinner. Tip some oil in a wok or large frying-pan. Add a generous shaking of Soya Sauce. Mix. You can buy a pack of Stir-Fry vegetables in a supermarket, or prepare your own. You don’t need to be too neat or fine. 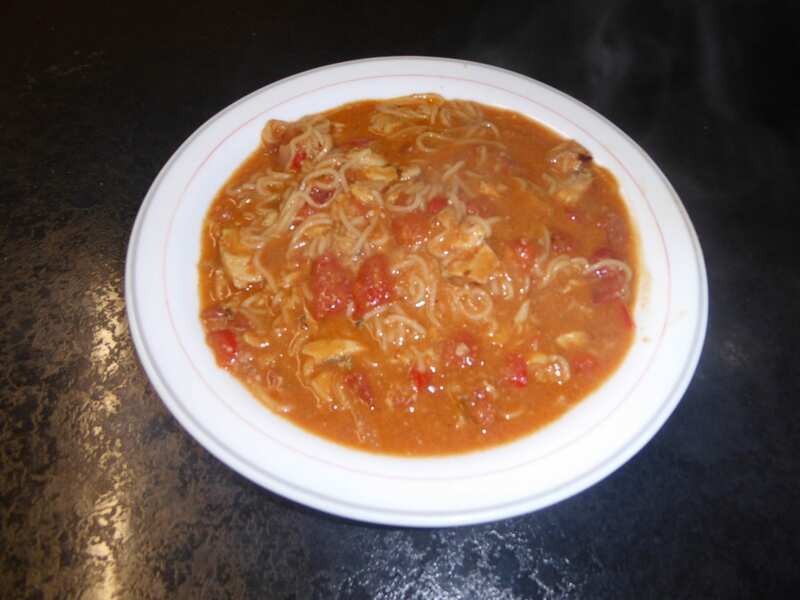 Use onion, carrots, peppers, Chinese or white cabbage, sliced mushrooms. You can also add beansprouts & bamboo shoots. 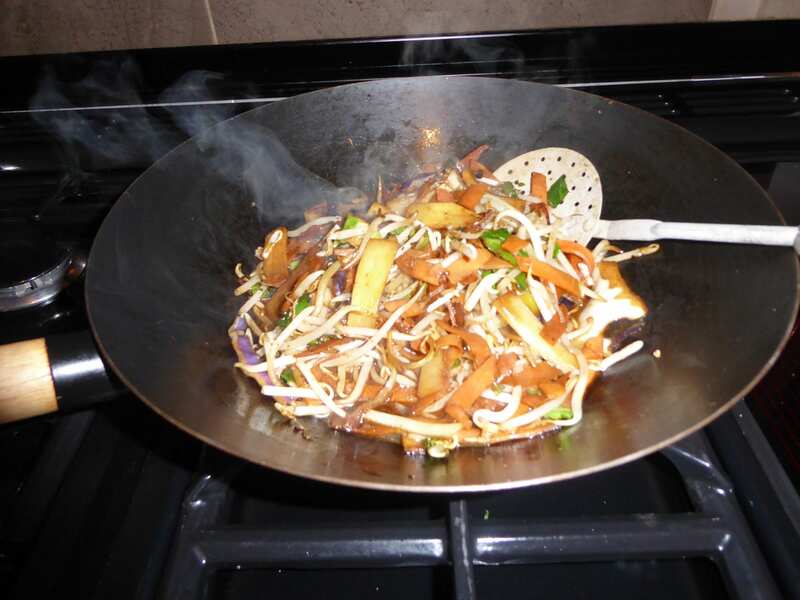 Stir-fry is cooked at a high temperature & you have to keep moving the ingredients about. Add flavours like a tblsp of honey, a couple of chopped pineapple rings, a squirt of tomato puree, lemon or lime juice, more Soya Sauce, cooked chicken or beef, herbs & Seasoning. Taste it & if you want to, add more of what you fancy! Serve with rice and noodles. In my photo, I served it with rice & a pork chop.